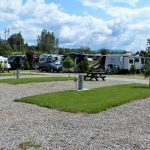 Ask fellow campers about "Kootenay River RV Park (Formerly Kootenay River RV Kampground)" and nearby attractions. The arrival was very good with a friendly young lady, she was very helpful. The park looked good and clean and close to the Trans Canada Hyw. The whole park is well maintained, so the toilets were good and clean. Aan komst was zeer goed met een vriendelijke jonge dame, ze was zeer behulpzaam. Het park zag er goed en schoon uit en dicht bij de Trans Canada Hyw. Het hele park is goed onderhouden, zo ook de toiletten waren goed en schoon. We camped at Kootenay River RV Park (Formerly Kootenay River RV Kampground) in a Motorhome. We stayed here for almost a week and loved it. It is an "adults only" RV park which was fine for the two of us. The location is great, right along the beautiful Kootenay River We had a long pull-through site and all of the utilities worked very well including the Wi-Fi. The people who ran the park were incredibly helpful and friendly. We camped at Kootenay River RV Park (Formerly Kootenay River RV Kampground) in a Fifth Wheel. We stayed here for two nights with our dogs. We were lucky to get a spot backing onto the river...very beautiful scenery! This is an adults only quiet campground so, needless to say, that is what it was. The spots are large and grassy and the grounds are immaculate. The owner is super nice and helpful. We loved it here, I'd certainly recommend it. We camped at Kootenay River RV Park (Formerly Kootenay River RV Kampground) in a Travel Trailer. Eclectic layout. Looks like it used to be a drive-in theater. Grounds are beautifully kept. The park is on the river and there is river access. There are a few back in sites that back up to the river. Because of the length of our rig we were given one of 3 pull through sites. Lovely, lush grass all around our rig but most sites are gravel pads with grass. Adult only park, very quiet. We camped at Kootenay River RV Park (Formerly Kootenay River RV Kampground) in a Motorhome. Easy access to Castlegar for groceries. Close to major highways but not noisy. Lions Head pub was close by and had a good selection of craft beers. There is also a golf course across the highway. This is well maintained and as an adult only park it is quite quiet within the park. However the Hwy is close and the train can be heard. The park is just above the river and on a hot day it is a good place to cool off. The grass is well maintained as are the washrooms and showers. The sprinkler system could be set up better as it sprays on the sides of the RVs leaving water spots. The hook up are good and positioned well. The staff are pleasant and work hard. The only funny thing is that the quoted weekly rate is really "stay seven days and get two for free". We stayed nine days so had to pay full rate for the last two days. Other parks would have prorated for the final two days. We camped at Kootenay River RV Park (Formerly Kootenay River RV Kampground) in a Motorhome. The park is close to the Trans Canada Trail. If you are into hiking check it out as well as the Brilliant Overlook Trail. This resort was very quiet as it is an adult only resort, the owners greeted us by name as we arrived and guided us into our site. Each site is manicured and watered daily. They also have planted beautiful flowers and young trees everywhere which adds to the beauty of this resort. The bathrooms and showers are new with beautiful upgrades, the nicest we have ever encountered at a resort. Some spots have river views but really any spot in the park is beautul. The owners really take pride in their park and it is very obvious right as you drive in. I would definitely recommend this resort to anyone who drives through Castlegar. We will definitely return! We camped at Kootenay River RV Park (Formerly Kootenay River RV Kampground) in a Fifth Wheel. The nightly rate was $36 Canadian. An excellent value. We were fortunate to have had a riverside site for our three night stay. Check-in was quick with the young attendant showing us our site and helping us back in. The pad was small stone and level, large enough for our 34 ft. trailer and truck. The hook-ups were central to the pad and quite new. The grass surrounding the pad was very well kept and green. The washrooms had been recently renovated with free showers and very clean. The river was a welcome relief to the 39C (near 100F) heat, but required caution when swimming or floating. This is a very fast and wide river, fortunately there was a small cove at the campground to use safely. Wifi was a bit weak at times but the cell signal was strong. This is an adult only (no kids) campground. There was lots of room for the biggest rig in sites 1-3 which were totally grass. This was one of the most pleasant campground we've stayed in and would definitely stay there again. We camped at Kootenay River RV Park (Formerly Kootenay River RV Kampground) in a Travel Trailer. The rail-trail was very enjoyable on the Columbia & Western Trail. This bike trail can be enjoyed on most types of bicycles. Great place next to the river very clean well maintained stopped for the night stayed 3 nights will be back. We camped at Kootenay River RV Park (Formerly Kootenay River RV Kampground) in a Motorhome. This is an adult only RV park and was very enjoyable. The grounds are kept in immaculate condition and the staff are very helpful and friendly This is a beautiful setting and is very quiet and relaxing. We camped at Kootenay River RV Park (Formerly Kootenay River RV Kampground) in a Fifth Wheel. This is a 55+ park which is located on an old drive-in movie site and provides superior service to older travelers. Our lot was on the riverside so we had a great view of the Kootenay and Columbia Rivers. It was a large site with 30 amp power, water, sewer, cable tv, gravel parking area and grass all around. The services are located at the front of the lot so you may need extensions for cords and hoses. There is a community firepit and the bathhouse has two toilets and sinks and one shower. We would stay at this park again. We camped at Kootenay River RV Park (Formerly Kootenay River RV Kampground) in a Travel Trailer. There are many attractions in Castlegar including the Doukhorbor Discovery Center, Verigin's Tomb, Main Street sculptures, and the old walking bridge. This is a beautiful little park in a beautiful setting. Grounds are immaculately landscaped, facilities are super clean. Staff are very friendly, helpful, & accommodating. Excellent value at $36/night Cdn. Cable tv with about 50 channels, free wifi with good connection. Laundry room has 2 of each machine, $2/load. We highly recommend this park. Would be a good idea to call in advance, though. It's small & likely fills quickly. We camped at Kootenay River RV Park (Formerly Kootenay River RV Kampground) in a Motorhome. We had a back-in river front site, booked for 2 nights. (When we phoned a day in advance to book a site, we weren't sure if we would stay 1 or 2 nights. We decided to stay for 2, we liked it so much!) The site was long enough for our 39 ft motorhome. We parked the tow vehicle across the street, which was close by. This is an adult only park with a 24/7 quiet time...we liked that! This is a small RV campground with a few permanents. We are able to book a site 1 day before arrival only because there was a cancellation and good thing we called. Each night we were there the campground with full even this late in the camping season. The caretakers stress that this is a QUIET ADULT ONLY campground with quiet time all day and night - no problem for us. Upon arrival you'll meet the nicest people you can hope for in any campground, registered us and showed us to our all-grass site. It was plenty big for our 5th wheel and truck with lot of space to stretch out. It was a full hookup site with steady power and good water pressure. Cable provided ample TV stations. The roads are just wide enough for one trailer to get around but not an issue at all. They have a small laundry room (2 washers and 2 dryers) but it was clean. 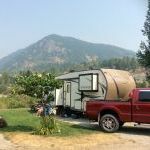 This is one of the best campground in the Castlegar area and we'll definitely be back. We camped at Kootenay River RV Park (Formerly Kootenay River RV Kampground) in a Fifth Wheel. Very close to Castlegar Golf Club - a must do for golfers. This adult only park was full on a Thursday night in September, good thing we had reservations. The friendly staff showed us to our riverside site and helped get us parked. The items are gravel pad with grass. Pedestals are new, our site had 15 & 30 service. Cable TV included. Wifi is great, no problem with email & web (not suitable for streaming movies). 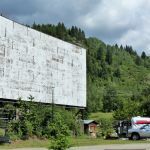 The park is on the site of an old drive-in movie theatre and the screen is still standing. Grounds and facilities are very well kept. Quiet park even though it was full. Excellent experience. We camped at Kootenay River RV Park (Formerly Kootenay River RV Kampground) in a Motorhome. Park is on the edge of town, you will need to drive for groceries,restaurants, etc. I was pleasantly surprised with the cleanliness of the park. This is an adult park, extremely clean and grounds well kept in the heart of the Rockies. The staff is very friendly and there is beautiful scenery. I stayed in a 40 foot 5th wheel with 50 amp full service. WiFi was great with a fast speed. I would stay here again with no hesitation. We camped at Kootenay River RV Park (Formerly Kootenay River RV Kampground) in a Fifth Wheel. Casino close by if that is your thing. Dam, suspension bridge, Castlegar close by, Nelson close by. River beside camp ground and fishing for trout is good. Kokanee Mountain Zipline not far. Golf is not far as well. This is a great little resort in an old drive in theater location. We had a site with a view of the river out the picture window in the rear of our trailer. Owners/staff were very friendly and very helpful. We camped at Kootenay River RV Park (Formerly Kootenay River RV Kampground) in a Travel Trailer. There was an "Art Walk" in Castlegar and we took a day trip to Nelson, BC. Nearby is the old Brilliant Bridge and Veregin Memorial Park. Castlegar, about 3 miles south, is the closest location for gas and groceries. Nice, challenging Golf Course nearby. Casino has great food, Prime Rib on Fridays. Interesting downtown section. Best Barber in BC downtown on Columbia Ave.
A short walk to the Kootenay river and good viewing of the local mountains. Fishing is good in the Kootenay river upstream or downstream of the camp grounds. A boat is recommended for most of the season. 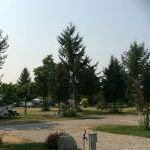 Are you affiliated with Kootenay River RV Park (Formerly Kootenay River RV Kampground) ?